What's the best way to proceed with your project? How do you know how long it will take, how much money to budget, how many people will be needed, and what third-party products should be purchased? Budgets are tight and you can't afford to make the wrong decisions. Assessments/audits ensure your project stays on track and delivers the highest ROI. 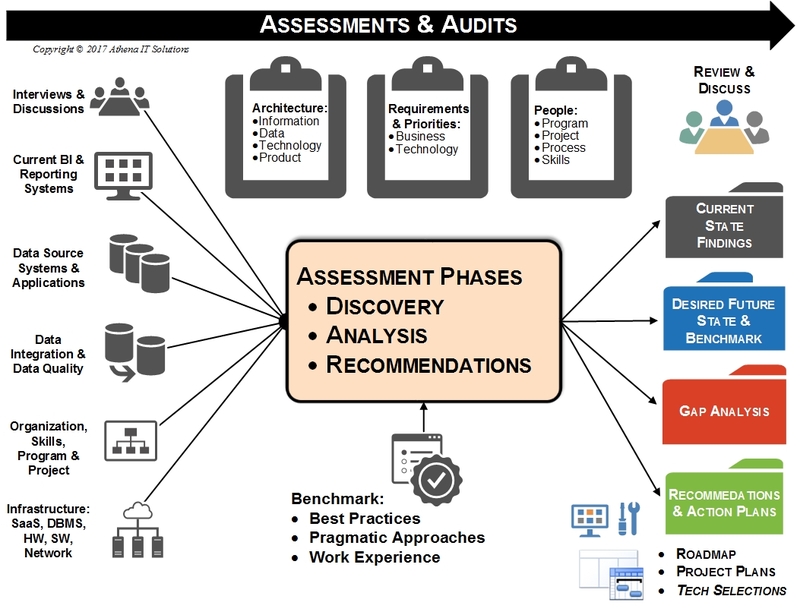 Whether your organization is starting a new BI endeavor or looking to evaluate an existing BI program, our assessment methodology will provide recommendations to deliver business return-on-investment (ROI). Is your business getting the information it needs to make informed decision, when it needs it? Are your current IT systems architected and deployed as effectively and efficiently as they should? Is your company using data shadow systems, and if so, what should you do about them? If you need a Big Data project, what's the best way to proceed? What third-party products will you need?